This beautiful WordPress theme could be a great choice for developing personal or professional websites. 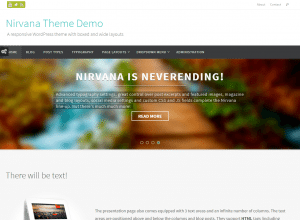 The highly customizable theme comes with more than 200 theme options to help you personalize the design. If you are looking for quick style changes, the built-in color presets will come in handy for you. The rich typography options enable you to choose any Google Font. As the theme supports all the standard post formats, you can publish image, audio, and video posts along with the regular posts. Make full use of the eight pre-packaged page templates to create the necessary pages. There are 12 widget-ready sections on various strategic locations of the theme. Strengthen your social media presence by adding links to your social media profiles. The drop-down menu supports multi-level navigation menu, which means your visitors will always have access to the necessary navigation links. The translation-ready theme features full RTL support, which will be very useful when you are creating websites in other languages. Feel free to check out the theme documentation to get detailed instructions about using the various theme features. It is also possible to get additional support from the free forum. The SEO-friendly theme is regularly updated to bring new features and improvements.